KUALA LUMPUR: Shares of KLCC Property Holdings Bhd (KLCCP) rose to a high of RM4.32 on Thursday after it announced plans to look into the setting up of a real estate investment trust (REIT). It dad authorised the management of KLCCP to explore a corporate structure including an appropriate REIT or equivalent. 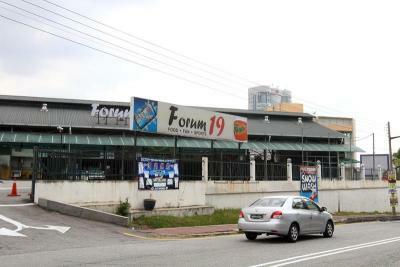 Application withdrawn: A developer had submitted their plans to build a SoHo and serviced apartment on the land that is currently used as a hawker centre in Section 19 this year. The Forum 19 development in Section 19, Petaling Jaya was the hot topic at a meeting held between residents of SS2B, the police and the Petaling Jaya City Council (MBPJ). During the dialogue, residents raised their concern over the 34-storey Small Office/Home Office (SoHo) units and serviced apartment development, and the lack of feedback from the relevant department on the status of the developer’s application. According to SS2B Rukun Tetangga chairman Willie Tan, the developer had submitted the plans earlier this year for the land that is currently used as a hawker centre. A few residents were informed about it before word spread. Tan said MBPJ should have informed all the residents since the development would affect them as the neighbourhood was next to Section 19. “No signboards for objection had been put up. Of course we would be concerned with the development as the road is already congested” he said. The residents sent several letters to MBPJ, objecting to the project but none received an official reply. Only a statement was seen in a local daily stating that the developer had withdrawn the application. “Some of the residents received a letter last week about the withdrawal. We were dissappointed that we were only informed after the withdrawal was done, which would mean the MBPJ left us in the dark during the application process. This is not right,” added Tan. The residents brought up the topic again, concerned that the project might take off once the area is re-zoned. However, Petaling Jaya Utara MP Tony Pua assured the residents that only projects that fulfil the requirements will see the light of day. Zone eight councillor Tony Cheong who was also present said they have upgraded the system for e-mail complaints from residents that will help with the follow-up of complaints made. Apart from that, the residents complained that the trees in front of their homes had not been pruned properly. This obstructs light from the street lamps, making the area unsafe for residents. Cheong said he would personally visit the site and notify the relevant departments. Also present at the meeting was Seapark police station Chief Inspector Gunam Resul Gulam and Damansara Utama assemblyman Dr Cheah Wing Yin’s representative Robert Tan. Some of the residents of Jalan 19/1 also complained about vehicles including lorries which double park on the road, causing massive congestion during peak hours. C/Insp Gunam assured the residents that he will place two officers to issue parking tickets to the vehicle owners. KUALA LUMPUR: Faber Group Bhd will continue to expand its integrated facilities management (IFM) business locally and overseas by targeting commercial buildings apart from hospitals. Faber managing director Adnan Mohammad said the company would continue to pursue the non-concession business in United Arab Emirates and India actively as there were opportunities there. He said the company was looking at commercial buildings, such as offices for the IFM arm, besides hospitals. “The competition is posed by low barriers to entry. We are coming up with innovative products related to energy and environment and link it with our services,” he said. Meanwhile, Adnan said the extension to the existing concession agreement (CA) for the privatisation of hospital support services was still pending. Currently, the company's IFM unit contributes 82% to revenue with the concession business contributing 64% and non-concession business the remainder. Adnan said the property unit, which contributed 18% to revenue, was still negotiating with landowners and potential joint-venture partners. 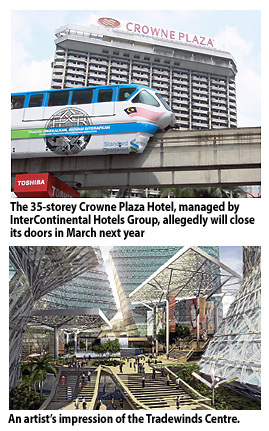 “With the on-going projects, we have until 2016 to complete (the lands we have) in Kuala Lumpur,” he told StarBiz when asked about the size of the company's landbank. “The 2.5 acres at Persiaran Gurney will be launched in the fourth quarter of 2012 and condominium units on a 5-acre site in Kota Kinabalu will be launched next year,” Adnan said. LONDON: British house prices fell back in June with the annual pace of decline reaching its highest rate for almost three years as the economy remained weak with little sign of a bounce back, mortgage lender Nationwide said on Thursday. House prices fell 0.6 percent in June after a rise of 0.2 percent in May, leaving prices 1.5 percent lower than a year ago, the lowest reading for annual growth since August 2009. "The slightly weaker trend we've observed since March is unsurprising, given the difficult economic backdrop, with the UK economy dipping back into recession at the start of the year and few signs of a near-term rebound," said Nationwide's chief economist Robert Gardner. Nationwide said the outlook for house prices remained highly uncertain, with economic conditions likely to stay challenging. But it said efforts by policymakers to boost credit to the economy and lower its cost should support demand, while the supply of housing remained constrained with construction failing to keep pace with the number of households being formed. "Overall, this suggests a continuation of the pattern experienced over the past two years, with prices remaining fairly stable over the next twelve months," Gardner added.